My husband mad these up for dessert one night, really tasty. Finely dice rest of strawberries and set aside. 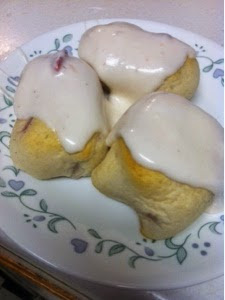 In a mixing bowl or mixer place remaining cream cheese, butter, and powdered sugar and beat until smooth, add diced strawberries and blend until well mixed, place in refrigerator with biscuits until ready to serve. Remove from refrigerator and frosting each biscuit and serve. Makes 10. I love this dessert! Hope you are having a great week and thanks so much for sharing with Full Plate Thursday.